University of Nebraska students, supporters and alumni talk to state senators in the Rotunda Gallery during "I Love NU" Advocacy Day on March 27 at the Nebraska State Capitol. The scarlet and cream of Husker Nation joined forces with Loper blue, Maverick crimson and UNMC red in the hallways of the State Capitol to advocate for the University of Nebraska on March 27. Coming together for “I Love NU” Advocacy Day, nearly 100 students, alumni and supporters from across the university system spent the morning meeting one-on-one with state senators and other legislative representatives. The university delegation was hosted by Sens. Kate Bolz (District 29) and Matt Williams (District 36). Bolz and Williams challenged those attending the advocacy event to talk boldly to senators about the importance of education and the university. Zak Folchert, a biological sciences/pre-med major from North Platte, was among representatives of the Association of Students of the University of Nebraska who attended the event. He waited patiently to talk directly with his senator, Mike Groene (District 42). In his sophomore year at the University of Nebraska–Lincoln, Folchert has grown his leadership skills through ASUN involvement, serving as a teaching assistant in the classroom and working as a first-year new student orientation leader. 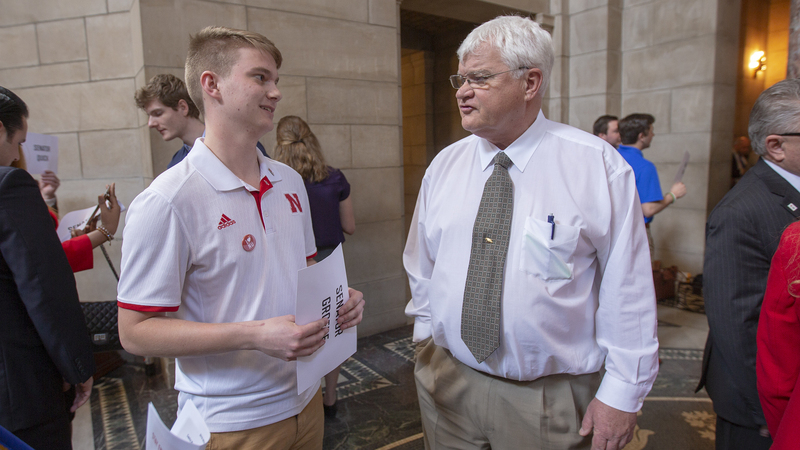 Sophomore Zak Folchert talks with Sen. Mike Groene as part of the "I Love NU" Advocacy Day on March 27. Folchert attended the event as a representative of the Association of Students of the University of Nebraska. 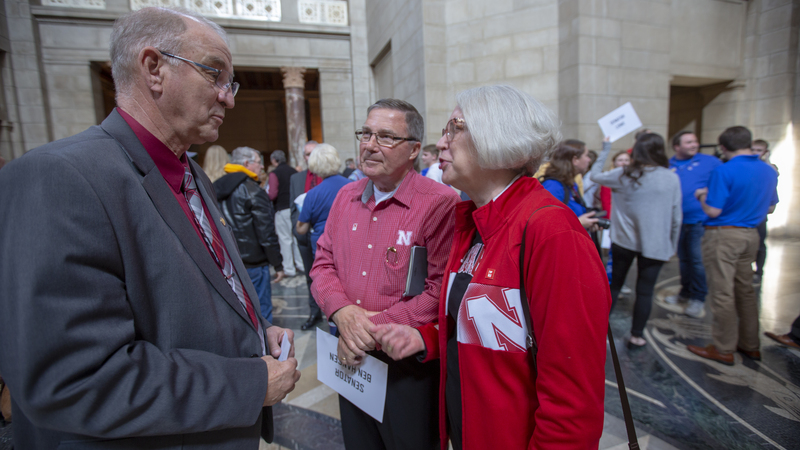 Along with students and other university supporters, senators talked with a number of Nebraska alumni — including Huskers Dori Bush, and Bob and Nancy Brandt. All three have deep ties to the university, having earned multiple degrees personally and having children/relatives graduate from Dear Old Nebraska U. “Coming to this university changed my life,” Bush said. “I met my husband here. I graduated from and worked here. I have one brother who graduated from UNMC and another who graduated from UNO. The Brandts, who live in Hickman, each have earned three degrees from the university — bachelor’s, master’s and doctorates. Their two children are also Husker grads, having advanced to earn master’s degrees. Sen. Myron Dorn (District 30) was among the representatives that the Brandts met with during the advocacy event. Nancy (from right) and Bob Brandt of Hickman talk with Sen. Myron Dorn during the advocacy day at the State Capitol. The Brandts each have three degrees from the University of Nebraska–Lincoln.